Former First Lady Barbara Bush signs a baseball for a West University Little League Challenger Division player in 2005. Hugh Tanner, left, current Chairman of the Little League International Board of Directors, with former First Lady Barbara Bush, Little Leaguer Alec Tanner, and Little League International President and CEO Stephen D. Keener at the 2005 West University Little League Opening Day in Houston. President and Mrs. Bush along with Dr. Creighton Hale, right, former President and CEO of Little League International, during Little League's 50th Anniversary celebration at the White House in 1989. 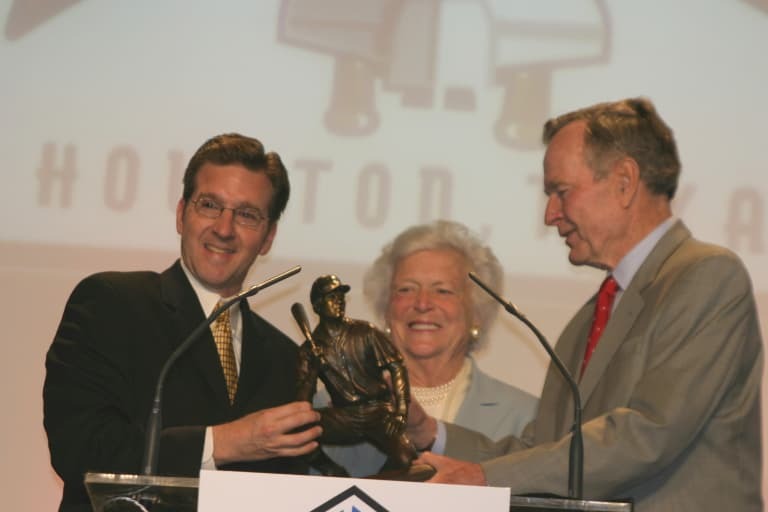 Little League President and CEO Stephen D. Keener presents an award to President and Mrs. Bush. President and Mrs. Bush at the 2007 Little League International Congress. Little League® International mourns the passing of Barbara Bush, the 37th First Lady of the United States, and a Little League mom. She was 92. Mrs. Bush, and her husband, the 41st President of the United States George H.W. Bush, had been Little League supporters for decades. For more than 60 years, Little League and the Bush family have crossed paths many times. In recognition of their support of Little League International, in 1980, the Little League Parents of the Year Award was established to acknowledge the parents of a Major League Baseball player, who were actively involved in their son’s Little League experience. 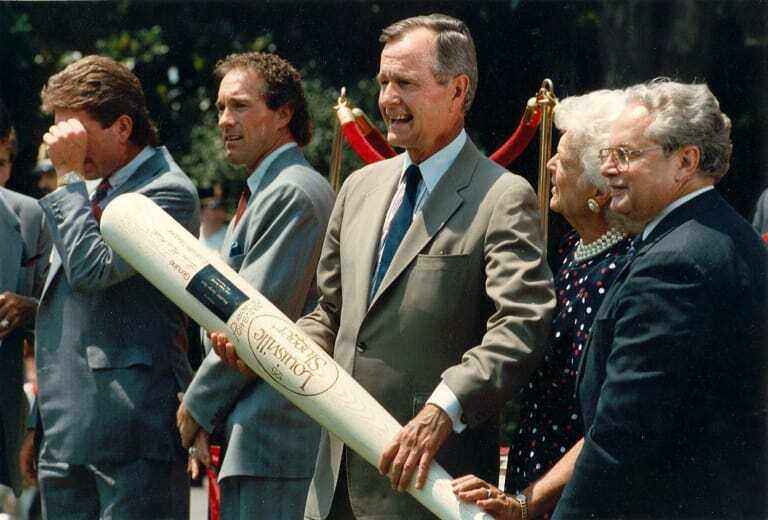 In 1989, Little League honored President and Mrs. Bush by adding their names to the award that is presented annually during the Little League Baseball® World Series in Williamsport, Pa.
Little League’s 50th Anniversary was also celebrated in 1989, when the Bush Family hosted a reception on the South Lawn of the White House. In a conversation during the 50th Anniversary celebration with Dr. Creighton Hale, former President and CEO of Little League, Mrs. Bush is quoted as saying, “If it weren’t for women, there wouldn’t be any Little League,” thus, the seed was planted for associating the Bushes with the Parents of the Year Award and creating Little League’s Mom of the Year Award. A few days following that event, President and Mrs. Bush traveled to the United States Embassy in Warsaw, Poland, with Dr. Hale to deliver the first Little League charter to leagues established after the fall of the Soviet Union. Mrs. Bush was sure to pass along her love of baseball and softball, and Little League. Following his election as the 43rd President of the United States in 2000, Mrs. Bush’s son, President George W. Bush, continued the family’s support of the Little League program by inviting Little Leaguers® to the White House as part of the “Tee Ball on the South Lawn” program. On March 12, 2005, in Houston, Mrs. Bush participated in the opening ceremonies for Texas District 16’s West University Little League, which celebrated the first year of the league’s Challenger Division. She threw out the first pitch at newly-renovated Paul Wallin Field. 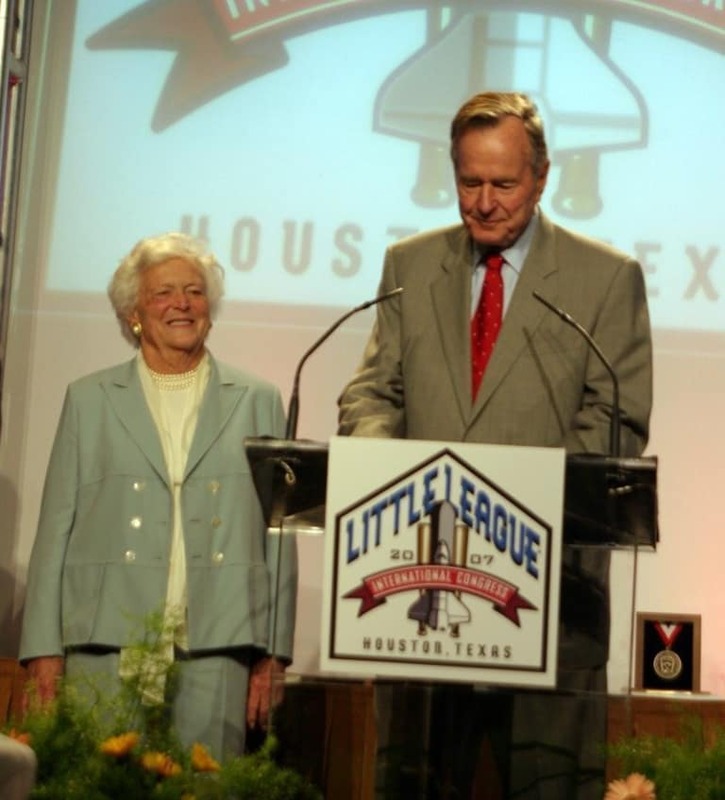 In April 2007, at the 24th Little League International Congress in Houston, former President and Mrs. Bush were honored as Little League’s “First Family,” during the Chairman’s Luncheon. And, nearly two years later, in January 2009, Little League’s Southwestern Regional Center in Waco, Texas, was named the George W. Bush Little League Training Center. Mrs. Bush was married to the former President for 73 years. She is also survived by her sons, George, Jeb, Neil, and Marvin; daughter Dorothy; and several grandchildren. She is predeceased by daughter, Robin.